Maintaining balanced tires helps avoid uneven tread wear, vibration and potentially unsafe driving conditions. This service checks the placement of weight around a tire and rim assembly. Keeping your tires in balance minimizes vibrations that can be felt in the steering wheel, seat and floorboards, and helps tires wear evenly. 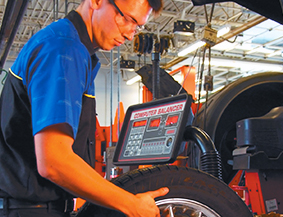 When should I have my tire balance checked or serviced?